Eastridge Workforce Solutions is dedicated to helping other companies strengthen their workforce, as well as strengthen our own. With the rebrand in January 2015, we focused on implementing changes within the organization and have seen increases in employee engagement, collaboration and communication. Follow these five actionable tips to effectively engage your multigenerational workforce. Only 40% of the workforce knows about their company’s goals, values, strategies and tactics. Corporate alignment connects employees across all divisions to the company’s expanding vision through open lines of communication and team-building activities. Encouraging alignment improves communication, increases employee morale and creates ownership in the success of your organization. 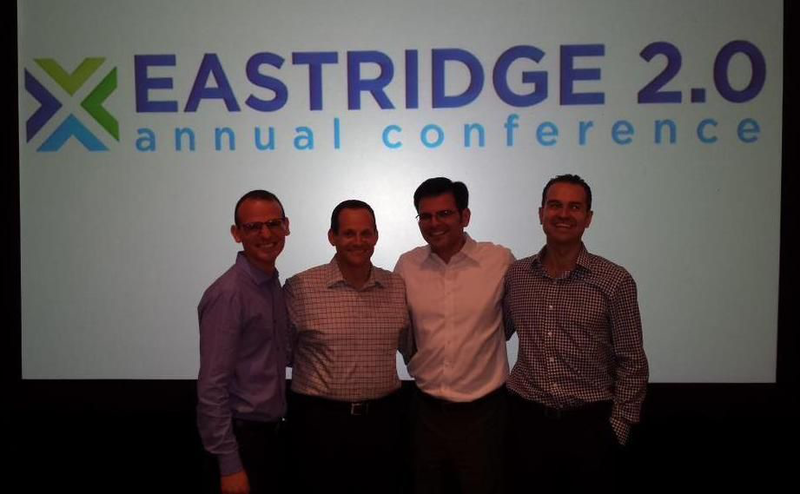 In 2014, Eastridge held its first annual conference, Eastridge 2.0. The one day event was filled with trainings, informative discussions, breakout sessions and team-building activities. Eastridge will continue these annual conferences that value team building, growth and collaboration to improve the company. Jason Svet, President of Workforce Technology; Seth Stein, President of Workforce Recruitment; Adam Svet, President of Workforce Management; and RJ Sparks, CFO & COO, are enjoying the Eastridge 2.0 Annual Conference in San Diego. Organizations with strong employee recognition are 12 times more likely to have strong business results. Make plans to show your employees how much you appreciate and value them. Companies that recognize their top talent see positive impacts on employee engagement, company culture and business success. 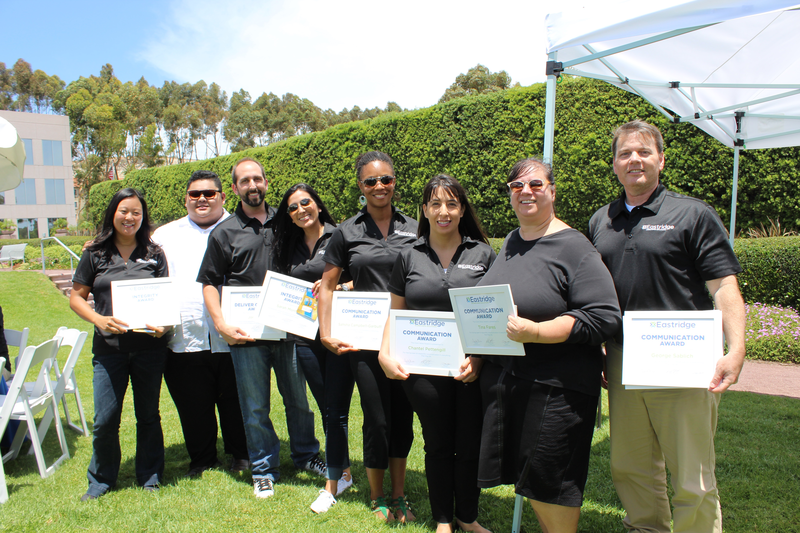 In July, Eastridge’s corporate office in San Diego hosted their first company barbeque. Employees enjoyed lunch together, participated in team-building activities and even had employee awards recognizing employees who exemplify the company’s core values: Deliver Our Best, Commitment, Creativity, Integrity, and Communication. Our Core Value Award winners at Eastridge’s 2015 Summer BBQ. Companies using incentive programs reported a 79% success rate in achieving their established goals. Incentive programs help make employees feel better recognized, increase employee performance, and improve the success rate of a company achieving their goals. In 2014, Eastridge launched a company-wide incentive program where all employees were eligible to receive a bonus and entry into a raffle to win a new 2015 Tesla. This new incentive program has proven to be successful as employees of Eastridge met and exceeded the goal four months before the scheduled end date. Additionally, it has served as a way for Eastridge to demonstrate commitment to the company’s core values and drive employee engagement. 76% of employees said they want opportunities for career growth. Make your company a place that employees want to stay long-term. Offering opportunities for early career advancement will allow you to retain your top talent in today’s competitive labor market. Eastridge encourages and provides early career growth and leadership opportunities for young professionals. Eastridge establishes trust and builds rapport with employees by allowing important decision making opportunities, independent ownership of projects, and leadership opportunities. 64% of employees using tuition assistance programs indicated a significant improvement in overall engagement and in commitment to their employer. Retaining top employees requires more than just providing competitive pay. Providing attractive benefits like tuition reimbursement gives you a competitive edge when hiring for top talent. Eastridge offers tuition reimbursement to support employees in their desire to complete higher education. Eastridge encourages tuition reimbursement programs to continue growing the team’s expertise and skill set. Eastridge values having a multigenerational workforce because it encourages a diversified work environment, enhances productivity and creativity, while introducing new skills. If you are having difficulty attracting, engaging or retaining a multigenerational workforce, contact Eastridge Workforce Solutions today. Our industry experts have helped startups to Fortune 500 companies successfully manage their workforce and overcome workforce challenges. Learn more about our comprehensive workforce management, recruitment and technology solutions.